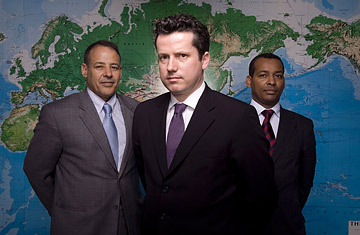 Carne Ross, center, with Polisario Front officials at their New York City offices. As Carne Ross talks about how he resigned from the British Foreign Office in 2004 after Britain's decision to go to war in Iraq proved more than he could abide in a frustrating 15-year diplomatic career, the phone rings. "That'll be Kosovo," Ross says. Probably calling to say thanks.